New book aims to empower and encourage people to tap into their intuition and unconscious selves to achieve their dreams and live better lives. “It will help everybody understand themselves a bit better so they know what they are really working with You can use your mind, your body and your intuition as tools to achieve and have whatever you want; it’s all right there. What if we all learned to tap into our unconscious mind? What if we learned to trust and follow our intuition? What if we learned to look past our fears, our blocks, our constant questions about ourselves and the world around us and do what we are meant to do? 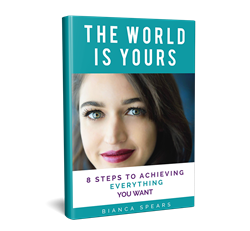 These are questions that Bianca Spears addresses in her new book, “The World is Yours: 8 Steps to Achieving Everything You Want”. Spears’ book isn’t asking the questions, however. In her eBook, available on her website (http://biancaspears.com) Nov. 28, she addresses the common challenges that hold people back from reaching their true potential. Spears, who works as an award-winning empowerment coach in her home country of Australia and travels often, says the book provides an opportunity for readers to get a better sense of what’s holding them back from living the life they want to live. The book is a culmination of several years’ work and allows Spears to share with others her vision for helping people reach their personal fulfillment goals. Quit Misplacing Power – In this chapter, Spears wants readers to learn to appoint themselves the leader of their lives. Follow your Truth – Readers will learn to find their true nature and how to embrace it. Create Your Own Opportunities – Readers will learn to ask for what they want and be open to new experiences. Dive into the Unknown – This chapter will help readers learn to embrace discomfort and face fear so they can do what they love. Choose Positive Influences – This reflective section will force readers to dig into their own selves to discover what’s holding them back from reaching success and fulfillment. Commit and Do it – Readers learn how to make and achieve goals, how to do the internal and external work that matters and will bring big results, and get unstuck from the focus on “how” and instead learn to focus on their dreams. Having spent roughly one out of every three days in the past seven years traveling, Bianca Spears is no novice at embracing and loving every bit of her life. She comes from the corporate world, but a few years ago decided to live life in the way she wanted: Traveling, meeting new people and creating her own special pocket of reality. Today, she takes the personal development experience and training she’s received from some of the world’s greats and helps others achieve their special and unique reality as an award-winning empowerment coach. She was featured on the October 2017 cover of Regan Hillyer’s Change Magazine.